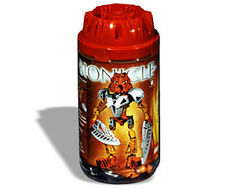 8572 Tahu Nuva is a BIONICLE set released in 2002. It includes Tahu after his transformation into a Toa Nuva. It also includes two silver swords, and a red Kanohi Hau Nuva. This set includes Tahu Nuva, the upgraded version of 8534 Tahu. Tahu carries two silver swords, which channel his power of Fire, and may be the most powerful BIONICLE weapons. Tahu can attach the swords to his feet to create a Lavaboard, which he uses to ride molten magma. This is a description taken from LEGO.com. Please do not modify it. The Power Lies Beneath! When the Toa are exposed to the strange energies of protodermis, they are transformed into the mighty Toa Nuva! With new powers, new armor, and new tools, the Toa Nuva are fully prepared for any threat to their island home. But will the power of the Toa Nuva save Mata Nui… or shatter it forever? Master of the molten lava! Tahu Nuva dwells deep within the Mangai Volcano, only venturing out to protect his people from the menacing forces that plague Mata Nui. His magma swords can be attached to his feet to make a lava surfboard, for lightning-fast travel down the sides of the volcano. Turn the wheel on his back to move his arms! With the Bohrok defeated, the Toa Nuva returned home and began to repair the damage done by the Bohrok. Each Toa had received a symbol at their respective Suva upon becoming Toa Nuva. Shortly after Tahu Nuva received his, Turaga Vakama gave Tahu the Vahi, Legendary Mask of Time. At their first meeting as Toa Nuva, the Toa all got into a fight while showing off their new powers. An argument began, once again resulting in the Toa going their separate ways. Tahu returned to Ta-Koro and encountered a strange new Bohrok, the Tahnok-Kal. When the Tahnok-Kal was escaping with Tahu Nuva's symbol, the Toa Nuva of Fire confronted him at the gates to Ta-Koro. When he tried to access his fire powers to stop the Bohrok-Kal, he was momentarily stunned by their absence. Tahnok-Kal took advantage of the delay to collapse the gateway above him, burying Tahu in a pile of rubble. By the time Tahu extricated himself, Tahnok-Kal had left. Tahu, Takua and Jaller pursued the Tahnok-Kal, following its trail to Le-Wahi. When in Le-Wahi, Lewa Nuva literally fell in on the group. He explained that his powers had disappeared as well, and joined the three in their pursuit of the Bohrok-Kal. The search led them next to Po-Wahi, where the two Bohrok-Kal they were observing met with another. This revelation led to the discovery of Pohatu, also powerless, encased in magnetized Mahi. The two Toa Nuva freed their ally, and he joined with them in the search. Their path led them all over Mata Nui, where the rest of the Toa Nuva, their powers also stolen, joined with them. Eventually, they ran into six Bohrok-like creatures who could talk and had different powers. They called themselves Bohrok-Kal and claimed to be searching for the Bahrag. The Toa Nuva attempted to fight them, but were essentially helpless without their elemental powers. They were all rendered unconscious by a combination attack of Vacuum, Sonics, and Electricity. When they awoke, the Toa Nuva discovered that the Bohrok-Kal had krana-kal as the Bohrok had krana. They split up to get the krana-kal from the Bohrok-Kal, sure that when they are removed, the Bohrok-Kal would be rendered helpless. Tahu tried to get Pahrak-Kal's krana-kal, but he was failing horribly. So enraged was he that it appeared he would rather sacrifice himself than give in. Jaller showed up and told him that he had no right to do so, and subsequently wrenched the krana-kal from Pahrak-Kal's body. Unfortunately, a Gahlok Va quickly replaced it with a new one. Later, Tahu met up with Lewa in Le-Wahi while searching for Kanohi Nuva. Lewa decided to be his guide through the jungle, and Tahu agreed. The Toa came to a swamp where Nuhvok-Kal had been earlier, as Tahu had figured out by studying impossibly heavy trees blocking the path. Lewa formed a plan to get several Le-Matoran to jump out from all directions and surprise Nuhvok-Kal. They got the Le-Matoran ready, and Tahu lured Nuhvok-Kal over by taunting him and then swinging on vines back to the swamp. The plan worked, but Nuhvok-Kal escaped. Gali later summoned Kopaka and Tahu to meet up with her to get their last three Kanohi Nuva in the Place of Shadow. Tahu and Kopaka were arguing the whole trip despite Gali's attempts to calm them. After getting through several challenges, they reached the masks, out in the open. They took the masks, only for the ground to crumble underneath them, leading to a chamber far below where the other Toa Nuva and Turaga Vakama were. They encountered a huge beast known as the Rahi Nui. With Vakama's help, they were able to beat the beast and then combined the powers of the Miru Nuva and Kakama Nuva to fly out of the chamber. The Toa split up and began again the fight against the Bohrok-Kal. Eventually, Tahu met up with Pohatu and Onua in Le-Wahi, who had a disturbing discovery that they refused to tell until they met up with the others. Soon enough, Kopaka, Gali and Lewa arrived and told of how they had formed a Toa Kaita Nuva, Wairuha Nuva, to try to defeat Kohrak-Kal, Lehvak-Kal, and Gahlok-Kal, but they formed their own Kaita and beat Wairuha Nuva easily. Pohatu and Onua told of their discovery: they had defeated Tahnok-Kal and removed its krana-kal, but the krana-kal said they were too late, that the Bahrag had already been found. The Toa Nuva descended into the Bohrok nest and had Lewa levitate down first. He saw the Bohrok-Kal fighting the Exo-Toa, the Bahrag in their prison and a large floating cube with spaces to put in the Toa's symbols. The Toa went down into the Bahrag's chamber, hoping the Kanohi Nuva masks they had found would be enough. Once down there, Tahu revealed to the others how Vakama had given him the Vahi. Unfortunately, the Vahi didn't affect the Kal who were protected by a force field as they drew so close to the end of their mission. Then Gali had an idea—to channel their power through their symbols and into the Bohrok-Kal. The Bohrok-Kal became arrogant with their newfound power, beginning to think they would not need to awaken the Bahrag. But the power kept coming, and eventually an overload of power destroyed each Bohrok-Kal. The Toa Nuva, their elemental powers returned to them, returned to their villages and hid their symbols in more secure locations, for a period of peace and prosperity. Tahu and the other Toa Nuva were told that they were not the first Toa team. Turaga Vakama told them of Metru Nui, the Toa Metru, the Visorak, and how they rescued the matoran. Then, as soon as they heard that Mata Nui was dying, they immedately headed for Voya Nui. But he rushed ahead and got poisoned, resulting in his team's capture. They were rescued by the Voya Nui Resistance Team and were told of the Toa Inika. Later, he, Takanuva, Nektann, and a Rahkshi wound up on Bara Magna, and came into contact with the Kanohi Ignika, transforming him back into a Toa Mata. Turning the gear on his back will cause his arms to rotate. Facts about "8572 Tahu Nuva"
This page was last edited on 17 December 2016, at 20:36.